In this survey of more than 1300 participants, 96% said they feel anxious about exams. This high percentage isn’t surprising, but it still raises questions about whether the education system is overly competitive and stressful. This isn’t a wise approach. Preparing for an exam is like taking on an important project. Would you start building a bridge without first coming up with a plan? Would you just begin construction and “hope for the best”? I doubt it. In a similar way, it’s important to outline, in writing, a strategy for how you’ll get ready for an exam. How many hours each week will you block out to study? Which topics do you need further clarification on? Which homework assignments will you review? How many practice exams will you do? How many times will you review your notes and your textbook readings? What distractions are you likely to face, and how will you overcome them? As the saying goes, “Failing to plan is planning to fail.” So make sure you have a plan for every exam you take. 2. Get on a sleep schedule at least one week before the exam. Many exams are scheduled for early in the morning—a time when students don’t usually feel very awake. If you’ll be taking a morning exam, start sleeping earlier at least one week before so that your body will have time to adjust. If not, your mind won’t be in an optimal state to take the exam. In general, it’s also a good idea to get eight hours of sleep each night. Getting enough sleep is vital if you want to improve your memory and mental focus. It’s tempting to stay up late, or even pull a few all-nighters, in the days and weeks leading up to the exam, but this is counter-productive. You’ll do better on the exam if you get adequate rest. 3. Don’t do any last-minute studying right before the exam. It’s common for students to spend the 10 minutes before an exam doing some last-minute studying. This may provide some psychological comfort, but overall it does more harm than good. 10 minutes before an exam, you either know the required information or you don’t. If you frantically review facts or equations during this time, you’ll become more stressed and anxious. This will negatively affect your performance. Instead, make use of the time before the start of the exam to relax. Visualize yourself answering the questions correctly, and imagine yourself in a state of peace and confidence. Take a deep breath. Inhale for four seconds, then exhale for four seconds. Repeat this as many times as necessary to calm down. 4. Turn your focus toward the process and away from the outcome. But I’ve observed that they rarely say anything along those lines. It’s this focus on the process, rather than the outcome, that ironically allows professional athletes to achieve better outcomes. This means that if you focus primarily on the outcome (for instance, repeatedly thinking to yourself: “I must ace this exam. I must ace this exam. I must ace this exam.”), you’re probably not going to ace the exam. If you want to ace the exam, you should, instead, concentrate on staying calm, on thinking through each question carefully, and on analyzing what each question is really asking. 5. Make use of exam-taking techniques. 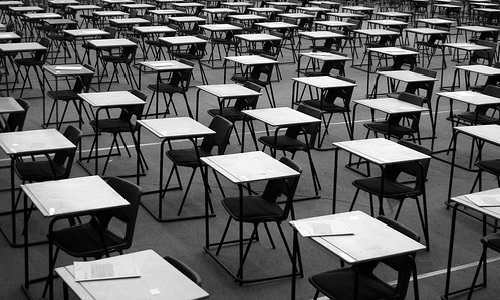 We like to think that exams are an objective measure of learning, but they’re really not. You might know the information like the back of your hand, but if you’re not equipped with the necessary exam-taking skills, you won’t get the grades you’re hoping for. Be familiar with the structure of the exam. How many sections will the exam have? What are the differences between the sections? Will there be multiple-choice questions, open-ended questions, or both? How many points will there be in total? During an exam, every second counts. Using a stopwatch will help you to keep track of the time more accurately. Look through the entire exam at the beginning. When the exam starts, don’t jump straight in and start answering the questions. Instead, take a minute or two to skim all of the questions. Get a feel for how challenging the exam is overall, and take note of which questions will be especially time-consuming. Set aside more time to tackle those questions. Know how much time you should spend on each question. Based on how long the exam is and how many points there are in total, you’ll know roughly how much time to spend on each question. For example, if you have 50 minutes to complete a 50-point exam, you have one minute per point. So, for a 10-point question, you should spend approximately 10 minutes answering it. If, after 10 minutes, you’re still not done with the question, it’s time to speed up. If you get stuck, move on. If you’re unable to solve a problem, maintain your composure and go on to the next one. Time is ticking. When you’ve completed the rest of the exam, come back to the unfinished problems. No matter how much you hate (or love) exams, they’re part and parcel of student life. By following the five tips listed above, I hope that the next exam you take will be an enjoyable experience with a happy outcome! How to Get on the Dean’s List (3-part series), series on how to excel in your schooling years and emerge as a dean’s lister (an honor awarded to top students).